They can be cute and cuddly pets or dirty and dangerous pests. 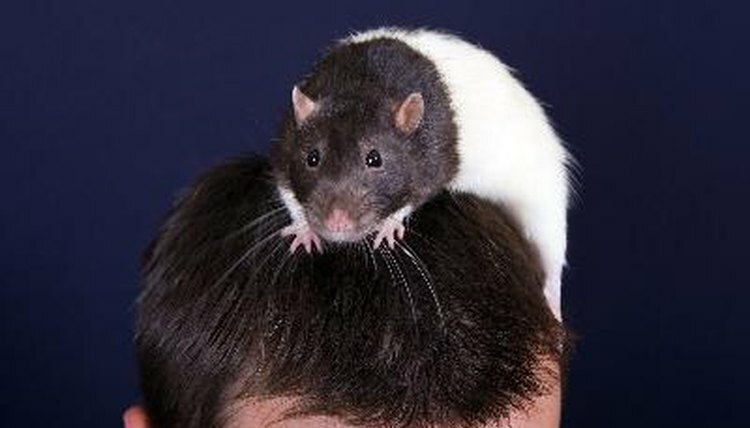 Either way, rats are often blamed for spreading diseases from animals to humans. Some are serious and require immediate treatment, while others simply cause discomfort for a few days. Leptospirosis, also called Weil's disease, is a bacteria that many rats carry without showing symptoms of infection. Humans become infected when contaminated rat urine or feces comes in contact with mucous membranes. Symptoms in people include headache, fever, vomiting, rash and muscle aches. Some people can become infected and show very few symptoms, while leptospirosis can be fatal in others. Salmonellosis, or salmonella, is another bacterial illness that both domestic and wild rats carry. Like leptospirosis, it is spread to humans through contact with urine and feces. In humans, salmonellosis causes gastrointestinal problems such as diarrhea, stomach cramps and fever. Most healthy adults will recover without any serious long-term problems, but in severe cases the infection enters the bloodstream and spreads through the entire body. As the name implies, rat-bite fever is typically spread when a rat bites a person. Scratches and contact with rat urine and feces can also expose you to rat-bite fever. There are two types of this ailment, including streptobacillary and spirillary. Symptoms of a streptobacillary infection include vomiting, joint and muscle pain, rash, vomiting and fever. A spirillary infection can cause a recurring fever, swollen lymph nodes and a rash. Rats are often blamed for spreading the plague. While they can carry and spread the disease, fleas on the rat are more often to blame. Fleas spread plague between animals and from animals to humans. Rats will die if they become infected with plague. Humans can also die without treatment, but antibiotics can are usually effective. Symptoms include fever, chills, weakness and swollen lymph nodes.